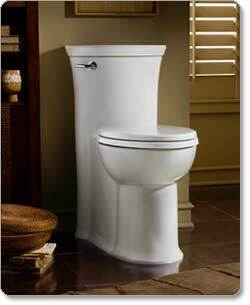 The American Standard Tropic Right-Height Elongated One-Piece Toilet features a siphon action bowl with a smooth-sided, concealed trapway and a PowerWash rim. It's made with durable vitreous china and includes a Duroplast slow-close toilet seat and cover that lift off easily for cleaning. The Tropic is water efficient--it received the highest rating in MaP tests and uses 6 liters per flush. Provides dependable one-flush performance with less water waste. View larger. The Tropic toilet provides efficient, water-saving performance. In the most recent independent MaP tests, it received the highest possible rating, handling up to 1,000 grams of solid waste in a single flush. 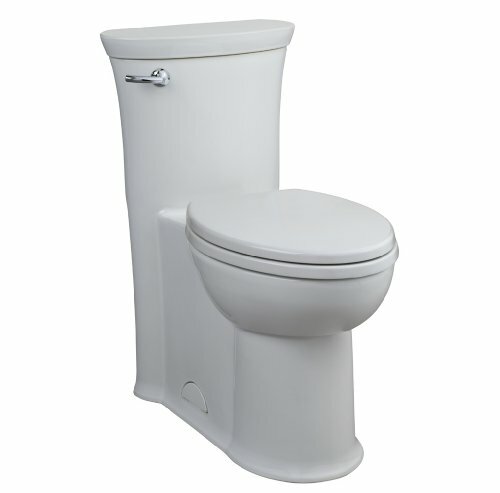 Using 6 liters (1.6 gallons) per flush, this toilet provides dependable one-flush performance with less water waste. The PowerWash rim traps air in the rim chamber and produces a pressurized rim wash to scour the bowl with every flush. For added convenience, this toilet comes with a color-matched Duroplast slow-close toilet seat and cover with an easy lift-off feature for simple removal and reattachment for more thorough cleaning. This toilet features a large flush valve with a chemical-resistant flapper that allows more water to enter the bowl quickly, creating a cleaner flush. The 3-inch opening lets water flow into the bowl over 80 percent faster than a standard 2-inch flush valve. The elongated, dual water jet bowl is more spacious than traditional bowls and provides a larger seating area. The toilet measures 29-3/4 by 16-3/4 by 30-1/2 inches (D x W x H). It has a 16-1/2-inch rim height for easy accessibility. The Tropic toilet is ADA compliant. The Tropic toilet is backed by a 10-year warranty. American Standard Brands has a complete lineup of chinaware featuring vitreous china or fine fire clay. From high performance to high style--and everything in between--American Standard delivers the products you need with the quality and value to fit any project. Toilet, seat and cover, and two bolt caps.